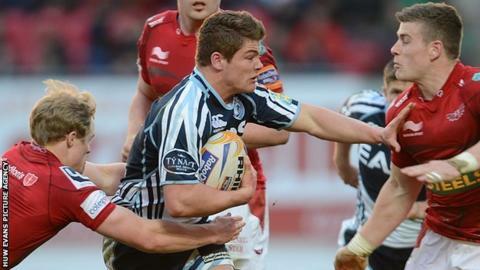 Scarlets have confirmed Cardiff Blues wing Harry Robinson is joining them ahead of the 2014-15 season. The move was revealed to BBC Radio Wales by joint Blues coach Dale McIntosh on 20 March. Robinson, 20, has made three Wales appearances - one against Barbarians and two against Japan, and has played for Wales Under-20. He has scored eight tries in 17 Blues appearances, having made his debut in the 2012-13 season. Caps against Barbarians in June 2013 and two more on tour in Japan followed. But he has not figured since for Wales and will hope to progress at Scarlets. Scarlets head coach Simon Easterby said: "We believe Harry will thrive in our young and ambitious environment but will also benefit from playing alongside a world-class and experienced player like [returning centre] Regan King. "He's an ambitious player who has great pace and the supporters can look forward to what he can bring next season in addition to existing Scarlets talent in the back three." McIntosh said: "A lot to do with it [Robinson's move] is the budget, the financial situation at the moment in Wales. "It's about manoeuvring those monetaries around and we were weaker in other areas. "We felt we did our best to keep him and I know he wanted to stay... but unfortunately that's the decision he's made. "He goes with all the best in the world and I really do hope and I know he'll do very, very well."